I was supposed to pick up my wife Javaneh from work. I opened the garage door and I saw a car parked five feet away, blocking the driveway. There was no way I could get out. I waited 15 minutes, thinking whoever parked there must have a quick business to take care of and would come back soon. Me and my friend Haideh, who has a flower shop nearby, also looked in nearby shops and restaurants for the car's owner, without any luck. Finally I called the police and asked what I should do. They said they would dispatch someone. Five minutes later an officer arrived and asked a few questions. I said I was going to pick up my wife but now she's coming home by bus. We had also bought tickets in advance to see "Charlie and the Chocolate Factory" (it's not very good) and we had to leave in an hour in order to make it to the theater on time. The officer tried to open the car door with a special hook, but was unsuccessful. In order to move the car, he needed to get inside and put the gear into neutral. A tow truck arrived and the driver was able to open the door. 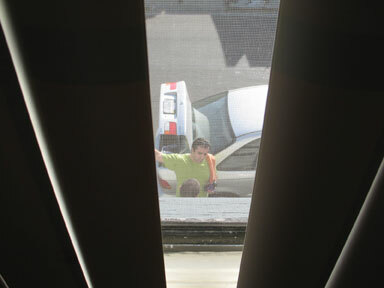 He attached hooks in front and lifted the car, ready to drive to the towing company's parking lot. Meanwhile the police officer searched the car and wrote down all the valuable items, so that nothing would get "lost" during the towing process. These included an expensive looking camera and a wallet, presumably belonging to the owner. I heard the officer having difficulty pronouncing the name (it sounded Hispanic) on a letter he had found on the front passenger seat. The tow truck was about to take off when I saw Haideh gesturing: The driver had apparently come back. I turned around and I saw a man in shorts and t-shirt rushing towards the car. He looked like he had been to a gym. How on earth could you park in front of someone's garage for more than an hour and then claim (quite vigorously) that you had done nothing wrong? How very Iranian! He did in fact have a slight accent, but I wasn't sure. Then I saw Javaneh walking from the bus station towards our apartment. As she passed by the offending driver to get to our door, he snapped: "Thank you! Thank you VERY much!" as if she was to blame for his misfortune. Come on... he's got to be Iranian. When Javaneh came inside the apartment she said, "Did you know the guy is Iranian? I heard him reacting to the cop in Persian. He said 'baba vel kon, geer nadeh' (give me a break, cut me some slack)..."
The video clips I took from the upstairs window do not have good sound quality: you can barely hear the conversations because of the rumble of the tow truck in the background. Still at least a couple are worth watching.